If you’re wondering why the Spotify desktop software has hardly been updated in a year, it’s because the company is preparing to launch a completely overhauled browser-based version of its streaming music service, multiple sources confirm. Along with moving to the web, the redesign will focus more on discovery, including following the listening habits and playlists of influencers in addition to your friends. One source even said a lower subscription price for its mobile app could be in the works. With a healthy user base and the record labels’ support, the browser version could help Spotify continue dominating the streaming music spotlight. Despite some thinking its current design is inferior to competitor Rdio, Spotify has had a blockbuster year since its U.S. launch a year ago. It came out swinging when Facebook unveiled the Open Graph platform at the f8 conference. One of the first active Open Graph apps, it immediately flooded Facebook’s new Ticker feed with stories about what friends were listening to on Spotify. It took Rdio a few days to get up and running, so even though it was already browser-based, Spotify had already begun to snowball. Click-throughs led to signups and in just six weeks, Spotify shot up from 1.33 million to 2.4 million daily users, and from 3.98 million to 7.4 million million monthly users according to AppData. Now it’s at a whopping 7.7 million dailies and 22.2 million monthlies, and 4 million of them pay $5 a month for ad-free service or $10 for zero ads and mobile access. But in that same time, Spotify’s full-sized version’s interface has remained quite stagnant. It has released a mobile app for iPad, beefed up its iPhone and Android versions, plus added privacy controls. It launched an app platform, and importantly began competing with Pandora by releasing a free radio service. Still, the core on-demand product looks almost exactly the same, and discovery is still pretty crummy. The What’s New section only shows five recommended albums, and eight top tracks your friends are listening to. Rdio’s discovery is much better, especially the Heavy Rotation section that shows what you and friends have had stuck in your heads lately, and intuitive profile pages for diving into someone’s favorites. Yet Rdio is believed to have a much, much smaller user base, and with MOG selling to HTC for just $14 million, it looks like Spotify is running away with the race. And now it’s poised to amplify that lead. 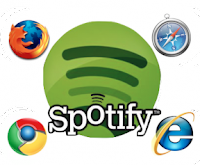 Multiple sources close to Spotify confirmed that the company is building out a browser version of its service. We’re awaiting a response from Spotify. It’s unclear if the browser version will replace its downloadable desktop software or just augment it but either way, it will make Spotify much more accessible. Users will be able to access a massive catalogue of music plus their playlists from any computer they log in to. Removing the download from the onboarding process could also help it sign up more users. One challenge will be making sure it the web version feels just as snappy. The browser version of Spotify’s on-demand and radio service could put it in more direct competition with Pandora, who are also browser-based. The revelation is another blow to Pandora, whose share price has been hammered by reports that Apple is planning its own radio. Discovery will also be rewired, I’ve learned. You can currently subscribe to non-friends’ playlists, but there’s no good way to find who you should be trusting for recommendations. People like the idea, though, considering Spotify director Sean Parker’s Hipster International playlist has 514,000 subscribers. Spotify will likely offer some sort of suggested user list of who follow, and may try to recruit big name celebrities, musicians, and DJs to share playlists. Finally, as smart phones proliferate and networks improve to handle streaming music, Spotify may change its price plans to encourage mobile usage. One source said Spotify is eying a cheaper option, potentially around $8 a month for ad-free and mobile service, but this unconfirmed. I wouldn’t be surprised if Spotify continued letting existing subscribers pay $5 for non-mobile, but stopped selling new $5 subscriptions. Then it could pitch “upgrade to mobile for $3 a month”, and “as a gift to our mobile subscribers we’re dropping the price” from $10 that seemed a little steep. This would simplify the plans, and squeeze more money out of new conversions and upsell more web-only subscribers. When Spotify first launched, it might not have had the chops to build on the browser. But it’s abigger, bolder company now. Unshackling from the desktop and offering access to nearly every song in the world from anywhere in the world could get millions more nodding their heads to the Spotify beat.